Taking to Instagram, Salman Khan posted the new Race 3 poster with a caption that read, “Aur Yeh Hai the #Race3 family. Let the #Race begin. Taking to Instagram, Salman Khan posted the new Race 3 poster with a caption that read, “Aur Yeh Hai the #Race3 family. Let the #Race begin #Race3ThisEid @SKFilmsOfficial @tips @rameshtaurani @remodsouza @anilskapoor @jacquelinef143 @iambobbydeol @saqibsaleem @shahdaisy @freddy_daruwala”. Trade analyst and film critic Taran Adarsh also shared Race 3 new poster and said, "The #Race3 family... Check out the new poster... Mark the date: 15 June 2018... #Eid2018". Revealing the ‘Boss’ aka Anil Kapoor, the superstar wrote, “"Bhaiji Humre Boss". 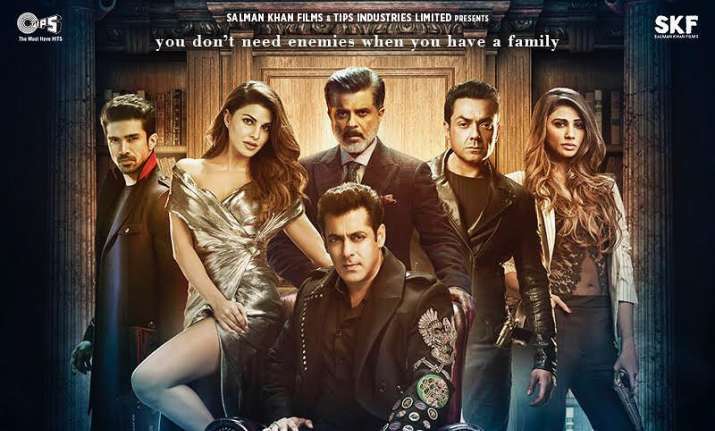 Starring an ensemble cast of Salman Khan, Jacqueline Fernandez, Anil Kapoor, Bobby Deol, Freddy, Saqib, and Daisy, the action thriller is one of the most awaited films. The action thriller brings back the super hit jodi of 2014's 'Kick' as Salman Khan and Jacqueline Fernandez are seen sharing screen space for the second time. There has been immense anticipation amongst the audience to witness the duo on screen again. Produced by Salman Khan Films and Ramesh Taurani under the banner of Tips Films, 'Race 3' is directed by Remo D'souza and will hit theatres on Eid this year.